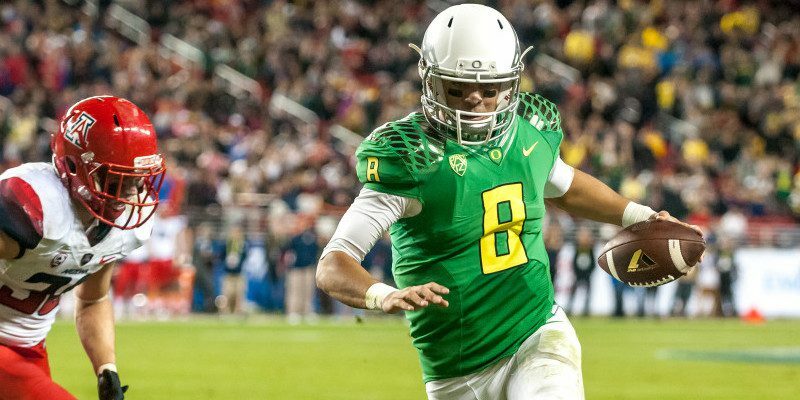 We all know that NFL “experts” don’t like “gimmicky Oregon spread offense players” such as Marcus Mariota right? Well, if you didn’t, then let me be the one to tell you – they don’t. This can be clearly seen in the fact that two of NFL.com’s so-called experts have Mariota going outside of the top 10 picks, with Bucky Brooks having him going as low as 13th overall to the New Orleans Saints. 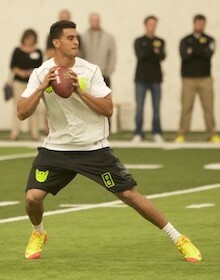 NFL experts had mixed reviews of Mariota at his pro day. But Mariota does make sense for the Saints. He is known for his mobility and ability to extend plays and throw accurately. Those features will allow Mariota, coming into Sean Payton’s re-tooled and more run-focused offense, to be a Russell Wilson-type QB. Moreover, this could be the start of Mariota joining the NFL’s Hall of Fame under a coach the caliber of Payton, a former QB. Mariota could be a HoFer with the Saints. Mariota had one of the greatest careers in college football history and had possibly the best season by a college QB just this past year en route to winning Oregon’s first Heisman Trophy. You can question how long it would take him to adapt to a “pro-style offense” if you want, but after all he has done in his college career while playing at a premier college, the mere thought that he won’t earn a chance to be an NFL starter would be a disappointment.